Today we introduce a new feature: “Cleopatra for a Day.” Displaced citizens open their little black books and spill the fashion and beauty secrets they’ve collected on their travels. First up is Helena Halme. One of TDN’s Random Nomads, Halme is a Finnish expat in London and a self-professed fashion maven. When my husband (“The Englishman”) and I did a house-swap in Los Angeles in the nineties, I discovered Origins, then a skin care range that wasn’t universally available here in the UK. Anything close to nature was an upcoming trend, and the Origins shops in LA looked quite revolutionary — all wooden flooring and straw shopping baskets. I still use a lot of Origins products and couldn’t live without their foot cream, Reinventing the Heel. Some time ago, an English friend recommended that I try Elizabeth Arden’s Eight Hour cream — I couldn’t live without it now. If I’d ever end up on a desert island, this would be the one luxury item I’d crave for. When I’d only lived in the UK for a matter of months, I cut my hair very, very short. The Englishman was away at sea and when he came back he was quite shocked to see my blonde locks all gone. But, gentleman that he is, he told me the new style suited me. (I’m not so sure it did!) Much more recently, I’ve discovered the the Brazilian blow dry, a luxurious treatment that makes my thick Nordic locks gleam. I feel like a film star! A few years ago on an annual girls’ trip with my school friends, this time to Rome, I bought a long down coat which has been my winter staple ever since. It was weird shopping for warm winter wear in the humid late summer heat in Rome, but it was great to have the style advice of good friends. I understand that the Displaced Nation has been been debating whether down coats can be fashionable. I’d be curious to hear your verdict on my Roman find! I seem to always run out of underwear when on holiday, so I have bought some in Rome, New York, Stockholm, Seville… Now what I bought — that would be telling! When on holiday in Puglia, Italy, a few years ago, I bought a set of plastic beads. I love them so much I still wear them. They’re a wonderful color that goes with everything. Crickey! It’s a miserably cold and rainy Sunday here in London so I’m in my favorite beige-colored Uniqlo jeans, an All Saints double layer t-shirt (bought at their London store in Spitalfields) and my blonde cashmere poncho from Plum. Underwear is Marks and Spencer (it is the one and only store for underwear for me) and there are warm & cozy Ugg boots on my feet. I don’t really have style icons — I believe that style is a very individual thing; but one person who I really admire is Helena Bonham-Carter. She used to come into the bookshop I worked at in North London and always looked wonderful, in her extremely unique way. However, I could not pull off her style. Two great places to people watch are Selfridges on Oxford Street and Liberty’s on Regent Street. There are lovely cafes in both stores where you can sip your latte and feel as though you’re on the front row of a Mulberry or McQueen show. 1) When on holiday to Greece, I learned to try saving my fair skin from burning through the application of sunscreen and after-sun moisturizer. 2) From watching French and Italian women on my trips to Paris or Rome, I learned about how to use a splash of color when wearing neutrals. 3) From my trips to New York I learned about simple lines, neat tailoring, and the chicness of one color (black) or two (eg, beige turtleneck with black trouser suit) — as perfected by designers like Michael Kors, Donna Karan and Ralph Lauren. Helena Halme blogs at Helena’s London Life and tweets at @HelenaHalme. She will soon be releasing a digital book based on a popular series of her posts, “How I came to be in England,” entitled The Englishman. STAY TUNED for tomorrow’s post, a male perspective on how to travel and look good. 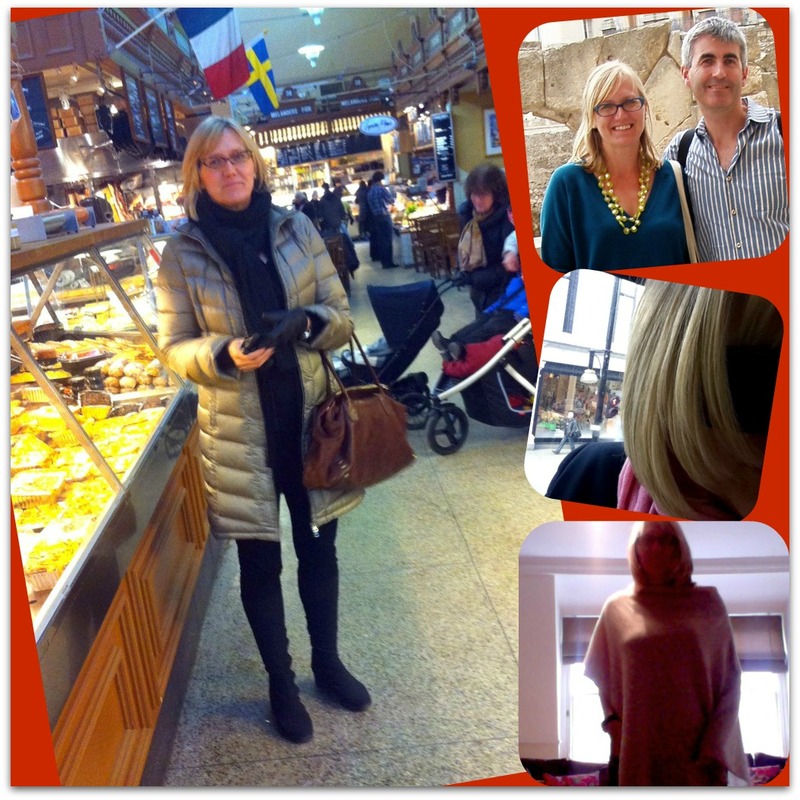 Images: (clockwise beginning with main photo) Helena Halme modeling her Italian down coat in Harrod’s food hall; posing with The Englishman in Italy, just after picking up the beloved beaded necklace; showing off her hair after a Brazilian blow dry in London; staying warm and stylish in London in her blonde cashmere poncho, just a few days ago.